A single drop of water, just less than a ten-thousandth of hair diameter before falling into solid ground, was inspiration enough for a group of mechanical engineers from the Houston Methodist Research Institute, in collaboration with the Politecnico di Torino (the polytechnic institute from Turin, in Italy), to build a model that introduces such changes in the understanding of water properties – many of them yet unknown – that, in time, engineers will be able to build contrast agents that will ultimately improve magnetic resonance imaging performances. According to information from the Politecnico di Torino, when a water molecule approaches a solid surface within a nanometer, its mobility is reduced immediately before it touches the surface – a phenomenon known as “nano confinement” that happens both because of electrostatic and so-called van der Waals attractive or repulsive forces between molecules. The researchers from Politecnico di Torino and Houston Methodist Research Institute looked at this phenomenon and took it further, building a quantitative model and physical interpretation that allowed them to predict the nano confining effect. 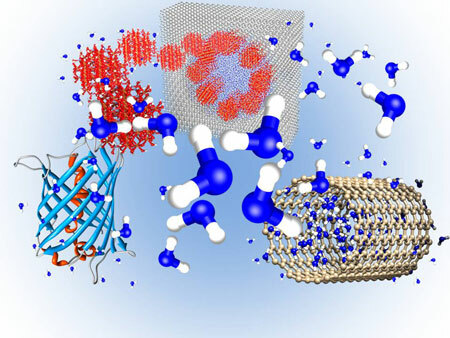 So far, after two years of computer-based and experiment-driven activities, they were able, for example, to relate the geometric and chemical characteristics, as well as physical conditions, of different nanoconfining surfaces, such as proteins or iron oxide nanoparticles, to mobility reduction and supercooling conditions of water – such as the persistence of water in a liquid state at temperatures far below 0ºC – when close to a solid surface. From applied physics to sustainable energy, it probably won’t be long until this study leads to an optimized design of a broad variety of novel technologies, such as suspensions out of water or thermal storage based on nanoconfined water within sorbent materials. But it was in the field of nanomedicine that the research has found a first important application. Almost sixty million magnetic resonance imaging scans are performed each year for diagnosis. There have been various significant scientific developments over the past decade that have improved MRI technology, allowing more precise images of pathological tissues. Contrast agents – substances used for enhancing the contrast of structures or fluids within the body – are among those which improved MRI accuracy. The researchers could successfully explain and predict the increase in MRI performances due to nanoconfined contrast agents, which are currently under development at the Houston Methodist Research Institute. When completely developed and put into operation, and since these nanoconfined contrast agents should improve the quality of MRI images, chances are that diseases in millions of patients will be detected earlier and more accurately. Biomedical, engineering and chemical research groups from Houston Methodist, Politecnico di Torino and Rice University at Houston, respectively, will soon publish additional results and applications on nanoconfinement effect on nanomedicine. Currently, the researchers are particularly focusing on iron oxide contrast agents loaded in silicon or polymeric nanovectors, since they can be first magnetically concentrated in human diseased tissues and then employed for enhancing MRI performances. Later on, this could be a significant step fighting cancer, as such nanoconstructs own theranostic properties, meaning they can be used for both diagnostic and therapeutic (temperature triggered drug release or hyperthermia treatments) purposes. Eliodoro Chiavazzo, Matteo Fasano, Pietro Asinari, from the Multi-Scale Modelling Lab, Department of Energy at Politecnico di Torino, and Paolo Decuzzi, from the Center for the Rational Design of Multifunctional Nanoconstructs at Houston Methodist Research Institute, were the researchers working on this project.